BotaniGard® Mycoinsecticide is an effective biological insecticide that is used to control whitefly, thrips, aphids, and many other insects. It is based on the highly successful fungus, Beauveria bassiana strain GHA, and controls the most troublesome crop pests – even resistant strains such as Q-biotype whitefly. 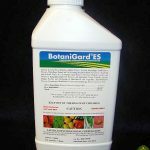 BotaniGard is versatile enough to use as a stand alone, as a tank mix partner, or in rotation with other insecticides. 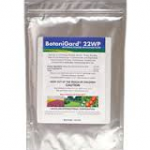 BotaniGard’s mode of action is unlike any conventional insecticide. The applied spores infect directly through the outside of the insect’s cuticle (the skin). Spores adhering to the host will germinate and produce enzymes that attack and dissolve the cuticle, allowing it to penetrate the skin and grow into the insect’s body. As the insect dies, it will change color to pink or brown, and eventually the entire body cavity is filled with fungal mass. The most common visible indication of insect death is a discoloration of the larvae or pupae. It is not necessary for a white fungal growth to occur to know the product is working; the insect is killed before this happens. BotaniGard controls a wide variety of soft-bodied insects in greenhouse, field and nursery crops such as whiteflies, thrips, aphids, psyllids, mealybugs, scarab beetles, plant bugs and weevils. It has excellent plant safety on a broad range of crops. BotaniGard is registered for an extensive number of ornamentals, herbs and spices, vegetables, fruits and berries. There is no limit to the number of times that BotaniGard can be applied in a season. A weekly application program can prevent insect population explosions and provide a level of control equal to or better than conventional chemical programs. • Early scouting and detection followed by application of BotaniGard when insect numbers are low result in most effective control. Apply at first appearance of insect pests. • Use a program of BotaniGard applied at 7-day intervals to keep your crop clean and prevent insect population explosions. If applied late or insects get out of hand, reduce the interval to 3-5 days, making at least 3 applications, and use a quick knockdown insecticide to help you regain control. • BotaniGard is a contact insecticide and thorough coverage is required to achieve control. • BotaniGard is safe for use with many beneficial insects. • Shake the container vigorously and thoroughly to suspend spores. • Insects are killed long before the appearance of fuzzy spore production. The presence of “fuzzy” insect bodies is not required to show product effectiveness. Note: Use caution when making applications to open blooms, especially on varieties known to be sensitive. Test on a small group of plants for effects on open blooms before applying to the whole crop. Always read and follow label directions.